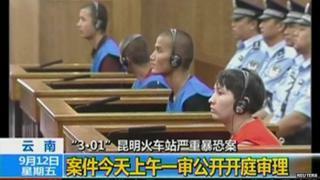 Three men convicted of involvement in the Kunming knife attack have been executed, a court in China says. Iskandar Ehet, Turgun Tohtunyaz and Hasayn Muhammad were convicted in September of murder and terrorism offences. The attack at Kunming station in March 2014, left 31 people dead and more than 140 injured. It caused shock across China. Beijing blamed it on Muslim extremists from Xinjiang, next to Central Asia. Xinjiang is home to the Muslim Uighur minority. It has seen a series of violent attacks and clashes which Beijing blames on separatists inspired by terror groups outside China. Uighur activists say the suppression of residents' cultural and religious freedoms is fuelling unrest in the region and attacks elsewhere in China. Police say three men did not take part in the station attack but had trained others for terror activities, the Xinhua state news agency reported. They were arrested two days before the attack, as they were trying to leave China. They were put to death on Tuesday, the Kunming City Intermediate People's Court said. Police shot dead four other assailants during the attack. One woman has been jailed for life. Why is there tension in Xinjiang?